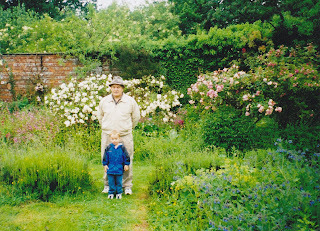 on our 2002 trip to England. because there were only three trios (not four) with the matching cake plate. price, and as you can see, they are in my home. What beautiful trios, and what wonderful memories. Love the photo of GJ and AJ! So pretty! Love the colors and what a wonderful find. Beautiful pattern! Perfect for you whether 3 or 4. And such wonderful memories associated always ups the value! 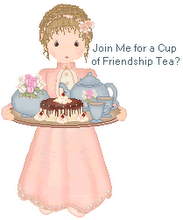 Thanks for linking to Thursday Tea Things And Talk! That is a beautiful set! A wonderful reminder of your trip! Your china is gorgeous, Linda! Absolutely stunning! Have a nice wknd! Oh my, he was a little fellow! I'm glad you bought those trios. As I heard someone say, I've had far more regrets about the things I did *not* buy than the things I did! And my how AJ has grown. I think those PJ's are a riot! This is a beautiful set... and I love the cake plate!